Dany PASCHALIDES & Kostas TRIGONIS have confirmed their dominance once again!! They have been THE TOP tornado sailors of the last 10 years, having won 15 titles in total over this period but also intoducing our class to young sailors!!! Martin and Julia Rusterholz, are the new Mixed European champions! They also had a great performance in the open category, standing on 5th! In short, today, after one hour of waiting, the thermical south wind came in, and slowly increased from 12 to 16 knots till the last race. Lot of pressure for the competitors at the start of race 6, the first of the day. At that game SUI 225 was the looser, as she was penalized being OCS. FRA 002 followed the waves of GRE 7 and finished at a superb 3rd place on the back of SUI 232. This was enough for Dany and Kostas to win the championship! At the start of race 7th, the last one, FRA 002 got surrounded by German boats, being to windward of GER 14 not making a good start. GER 14 rounded first mark No1 after following magnificent strategy. The fights during the downwind and the last lap were again of a high level, with Tornado hulls planning on small but breaking waves of the Largo Di Garda. 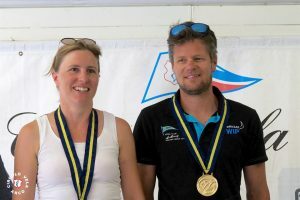 2nd mixed crew Dietmar Maurer and Katrin Oldenburg, while on 3rd stand last year’s mixed World champions Zdenek Pavlis and Michaela Pavlisova!! 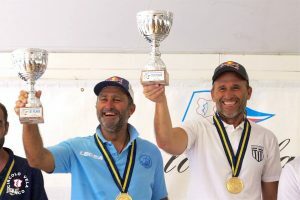 Once more the Lago di garda has confirmed its excellent reputation by providing a superb championship.